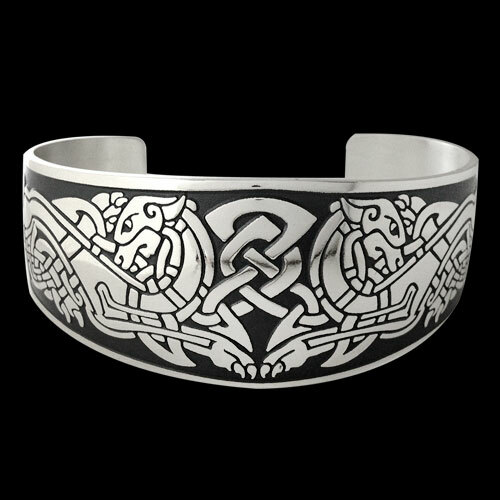 Sterling Silver Hounds Of Arawn Bracelet by Metal Arts Group. In the Welsh lore, Arawn ruled over Annwn, a land of peace and plenty. While hunting, Pwyll (Prince of Dyfed), came upon a pack of hounds feeding on a deer. He quickly drove them off not realizing they were the Hounds of Arawn. To makeup for his wrongdoing, Pwyll agreed to trade places with Arawn and defeat his greatest enemy Hafgan. From this arrangement, a great friendship was born. 6.3 x 1.3 inch Sterling Silver Hounds Of Arawn Bracelet by The Celtic Lady. Made in USA.